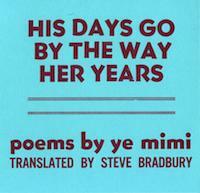 "In both languages, His Days Go By the Way Her Years is a beautifully weird book." Steve Bradbury’s poems, essays, and translations have appeared in a number of literary journals and earned him the 2011 PEN Translation Fund Grant. He is editor of Full-Tilt: A Journal of East-Asian Poetry, Translation and the Arts and Associate Professor of English at National Central University in Taiwan. Ye Mimi is a young Taiwanese poet and filmmaker. A graduate of the MFA Film Studio Program at the Art Institute of Chicago, she is the author of two volumes of poetry, most recently The More Car the More Far (Taipei: Garden City Publishers). Her poetry has appeared in Hayden’s Ferry Review, Asymptote, Jacket 2, and other international literary journals.